What’s the Difference Between Lumineers® and Veneers? 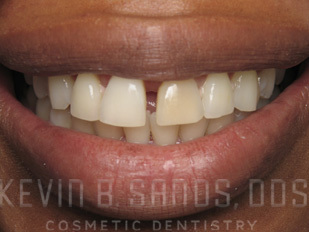 Dental veneers can rejuvenate your smile by covering and concealing a wide array of cosmetic concerns. Whether you have cracks, chips, stains, gaps, or mild tooth misalignment, Dr. Kevin Sands offers a variety of dental veneer options that can give you a more vibrant and youthful smile. Since there are so many types of veneers to choose from, Dr. Sands uses the initial consultation process as a time to help you explore your options and make a well-informed decision. Porcelain Veneers: Standard porcelain veneers are a durable tooth restoration that can conceal tooth imperfections while simultaneously giving you a natural-looking smile. Composed of a high-quality ceramic and hand-layered porcelain, each veneer is custom-made to match the shape and shade of the surrounding teeth. Porcelain veneers often require only minimal preparation for the tooth so that the majority of your tooth’s natural structure can be preserved. Lumineers®: A Lumineer® is a particular brand of porcelain veneer that has a couple of unique advantages. With all the same benefits as standard porcelain veneers, Lumineers® often require zero tooth preparation, preserving the entirety of your natural tooth. In addition, Lumineers® are composed of Cerinate® ceramic, which is an even thinner material that can eliminate the need for drilling or injections – all without compromising the durability of your restoration. View our before-and-after smile gallery and find answers to frequently asked questions about porcelain veneers here. If you have been searching for a fast and easy way to elevate the appearance of your smile, dental veneers are one of our most popular cosmetic dentistry procedures for tooth enhancement. Dr. Sands will examine your teeth, listen carefully to your aesthetic goals, and help you choose which type of veneer can meet your expectations. 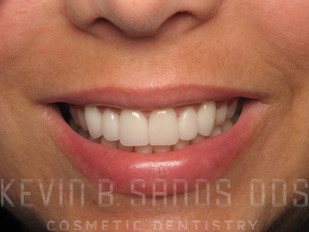 With dental veneers, you can enjoy a more youthful and beautiful smile! To learn more, or to schedule an appointment with Dr. Kevin Sands, please contact our office today. In our last blog entry, we talked about the importance of early detection for minimally-invasive dental treatment. Today, we’ll discuss some of the many treatments available that can conserve as much of your original tooth structure as possible in order to create beautiful, natural-looking results. 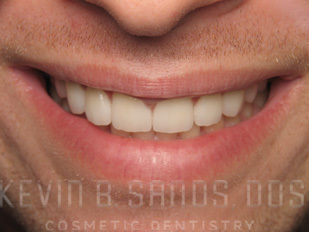 In all of Dr. Sands’ dental veneer procedures – including porcelain veneers, composite veneers, and prepless veneers – he works diligently to preserve most, if not all, of the natural tooth without the need for excessive shaving or partial removal of the affected tooth’s original structure. 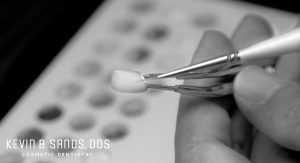 While the original tooth will need to be prepared for a cosmetic bonding procedure, Dr. Sands aims to conserve as much of it as possible so that the bonding material can augment its appearance and resolve the initial problem with a very natural-looking blend and contour. Dental implants actually make it possible to offer a more conservative missing teeth replacement solution when compared to alternative treatment options. With a procedure such as a dental bridge, the natural surrounding teeth must often be shaved and reshaped to accommodate the artificial tooth or teeth between them. This could make the natural teeth more likely to require root canal therapy in the future. Dental implants do not typically necessitate the alteration of surrounding teeth, and they offer a permanent solution for teeth replacement. These treatments can sometimes serve as an alternative to dental crowns. Whereas crowns require significant removal of the original tooth structure, treatment with inlays and onlays often require much less. While heavily damaged or decayed teeth may need a full crown for the best results, inlays and onlays may be a suitable treatment for patients with less severe damage. These are just a few examples of treatments that can be performed with a minimally-invasive approach. Conservative dental techniques can ultimately lead to much longer preservation of your original teeth, and less treatment needed to correct common imperfections and rejuvenate your smile! If you would like more information, or if you would like to schedule an appointment here at our practice, please contact Dr. Kevin Sands. One of the best things about today’s cosmetic dentistry options is that many treatments can be performed without the need to change much of your original tooth structure. 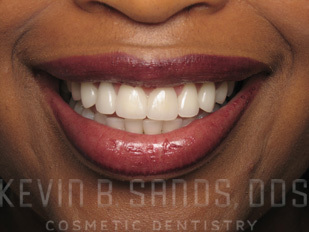 Conservative dentistry, or minimally-invasive cosmetic dentistry, is very important to Dr. Kevin Sands. When a tooth has been heavily damaged by decay, normal wear-and-tear, or other causes, parts of it may need to be removed in order to accommodate a natural-looking, customized restoration. A conservative approach utilizing advanced treatment techniques allows Dr. Sands to help you maintain as much of your natural teeth as possible, even while performing procedures that have traditionally required the grinding down or alteration of the tooth being treated – and early detection of dental problems can go a long way toward ensuring that a conservative treatment approach can still be applied. Minimally-invasive dentistry not only makes it possible for Dr. Sands to preserve much of your natural tooth structure – it also means that you’ll ultimately need less treatment to restore and rejuvenate the affected tooth. By coming in for regular dental exams and cleanings (at least two per year is recommended), problems can be identified quickly. Decay, cavities, teeth that have become worn down, and many other issues can be addressed before they get much worse. Once heavy damage has set in, it reduces the chance that minimally-invasive treatment can be performed, and makes it more likely that larger portions of the original tooth will need to be removed to accommodate a restoration that will improve its strength and appearance. Dr. Sands focuses on providing patients with minimally-invasive treatment techniques as much as possible – even with cosmetic treatments such as porcelain veneers, cosmetic bonding, and many others. Remember, early detection is vital to preserve the health and durability of your original teeth and allow Dr. Sands to renew your smile with conservative dental treatment and results that look and feel natural! 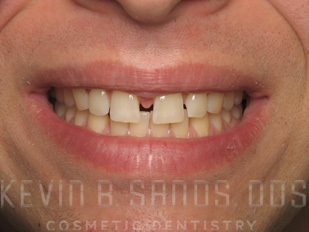 Be sure to check out the next blog in our series on minimally-invasive cosmetic dentistry. We’ll be talking about some of the conservative treatment options that can fix common dental imperfections and beautifully rejuvenate the appearance of your teeth. If you would like more information on minimally-invasive cosmetic dentistry options, or if you would like to schedule a consultation, please contact Dr. Kevin Sands today. Porcelain dental veneers are one of the most popular cosmetic dentistry treatments here at the practice of Dr. Kevin Sands. Custom-designed to improve common aesthetic imperfections such as stains and discolorations, chips and cracks, gaps and spaces, and even some cases of teeth misalignment, porcelain veneers have proven to be significantly effective for enhancing the appearance of the teeth and rejuvenating the smiles of people across the globe. We also accept cash and a variety of major credit cards. We firmly believe that porcelain veneers can be a valuable investment in the look and health of your teeth, and we want to make these treatments as financially convenient as possible. Dr. Sands is also an extraordinarily qualified cosmetic dentist who has performing porcelain veneer procedures for decades. He has treated some of the most famous smiles in the world, and has helped many patients enhance their smiles with these advanced treatments. Utilizing his artistic sensibilities and his considerable experience in dentistry, Dr. Sands can provide you with customized porcelain veneers that look beautiful and natural. 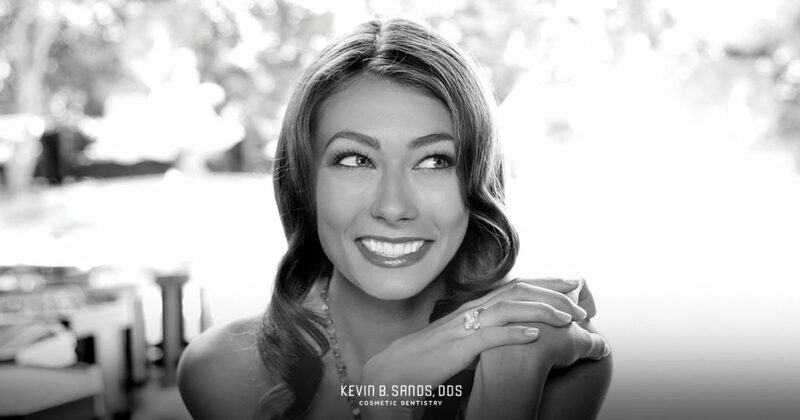 For more information on porcelain veneers, we encourage you to contact Dr. Kevin Sands today. We will be happy to answer any questions you may have, or assist you in scheduling an appointment with Dr. Sands. What is the Difference Between Porcelain Veneers and Crowns? While porcelain veneers and dental crowns share many similarities in what they are designed to do, there are also some important differences. Porcelain veneers can improve a range of dental imperfections, including chips and gaps, misalignment, stains and discolorations, and other issues. Crowns are often most beneficial for teeth that show signs of severe damage or decay. They are also routinely utilized as part of root canal therapy, dental implant procedures, and bridges. To be sure, crowns offer a huge aesthetic benefit, improving the appearance of the affected teeth with results that typically look very natural. In addition, crowns also serve to provide incredible strength and support to the original tooth, protecting it from further harm and, in many cases, eventual tooth extraction. The chief difference between porcelain veneers and dental crowns is the fact that veneers cover only the front, most visible portion of the tooth, whereas crowns cover the entire tooth. Crowns are often necessary when the tooth is in a serious state of disrepair; porcelain veneers, while very helpful with enhancing function and protection in some cases, typically offer more of a cosmetic benefit. The important thing to remember is: both crowns and veneers are custom-designed for each patient’s individual needs. That is one of the many reasons why these treatments are so effective – they are specifically created for your teeth so the fit is precise and the results look natural. Plus, veneers and crowns are color-tinted to match surrounding teeth and attached with a durable cement to ensure results can last for decades with appropriate care. These treatments can be very beneficial as stand-alone procedures, or as part of a complete smile makeover. Once our experienced cosmetic dentist, Dr. Kevin Sands, has met with you for your initial consultation and oral evaluation, he will explain your options and determine whether a crown or a porcelain veneer is best for your needs. For more information, or to schedule an appointment, please contact us today! 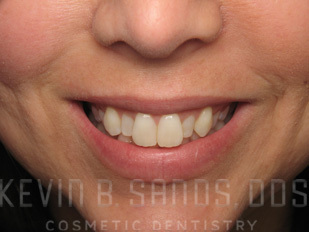 Porcelain veneers are what people often refer to as “caps.” These treatments have been utilized in cosmetic dentistry for many years, and offer patients a way to inconspicuously mask common dental imperfections with results that look natural. 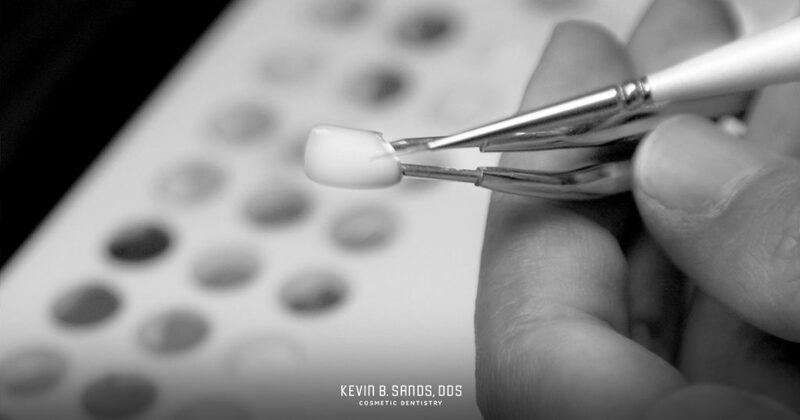 Dr. Kevin Sands has been performing porcelain veneer procedures for decades, and he believes they are one of the most effective options for helping patients enhance both the health and appearance of their teeth. One of the many benefits of porcelain veneers is that they are completely customized for the best possible fit and appearance. They cover only the visible portion of the tooth, and the results are known to last for several years with proper care. Check out our porcelain dental veneers photo gallery to see the renewed smiles many of our patients have achieved with this treatment. Dr. Kevin Sands will be happy to meet with you to talk about your options and help you decide if porcelain veneers can achieve your goals. If you have questions, or if you would like to schedule a consultation, please contact Dr. Sands today.